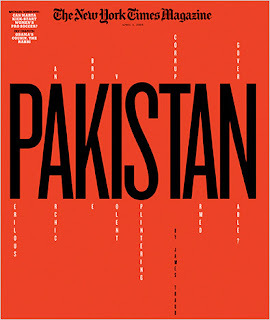 The cover story of yesterday's Sunday Magazine was Can Pakistan be governed? The article is more about Zardari - Pakistan's Nero and Groucho Marx all in one - rather than the question posed in the title. In fact, one thing that came out if it is the strong desire in Pakistan for a democratic system. Unfortunately, the headlines are dominated by the influence of Taliban - rather than the vast civilian protests as part of the Lawyers Movement. It is ironic that the title of this article could easily have been Pakistan's Burgeoning Civil Society. But then - that would not have fit the current perception of Pakistan and may not have been the cover story of Sunday Magazine. 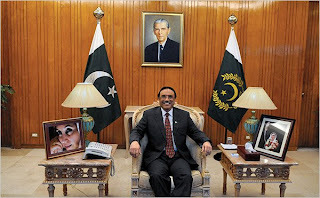 Couple of quick points on the article: It lays out Zardari's competence level and his personality quite well. In fact, Zardari would have made a great president of a small irrelevant republic. Eccentric, charming, aloof, and arbitrary. At one point James Traub writes of Zardari's response as: "he embarked on another adventure in logic". Ha! He would have been great as a comic relief at the UN. Unfortunately, he is the head of Pakistan - in one of the country's most turbulent times (and Pakistan has had many!). Pakistan feels as if it’s falling apart. Last fall the country barely avoided bankruptcy. The tribal areas, which border on Afghanistan, remain a vast Taliban sanctuary and redoubt. The giant province of Baluchistan, though far more accessible, is racked by a Baluchi separatist rebellion, while American officials view Quetta, Baluchistan’s capital, as Taliban HQ. American policy has arguably made the situation even worse, for the Predator-drone attacks along the border, though effective, drive the Taliban eastward, deeper into Pakistan. And the strategy has been only reinforcing hostility to the United States among ordinary Pakistanis. And amid all that, Pakistan’s president appeared to be playing with fire. Zardari was setting his security forces on peaceful demonstrators, just as his authoritarian predecessor, General Musharraf, did — against members of Zardari’s own political party — several years earlier. Government-by-crony is scarcely unheard-of in Pakistan — or elsewhere. But the urgency of Pakistan’s problems make clubhouse rule seem like a dangerous anachronism. One morning I met with Ahmad Mukhtar, the minister of defense. I asked an aide why we were meeting in the office of Pakistan International Airlines. “Oh,” he said, “Mr. Mukhtar is also chairman of P.I.A.” — another government post. Mukhtar offered a series of extremely stilted explanations for his party’s behavior in the current political crisis as well as for the president’s accumulation of wealth — “Anyone who has land will become very rich in this country” — and spoke of military matters with surprising vagueness. I asked if he had a background in either the military or aviation. “No,” he said, “I’m a businessman. We’re into shoes.” His family had 400 shoe stores. More important, he was a PPP veteran and a Zardari loyalist who spent time with him in jail. Aaah! Enemy at the gates? What enemy? Zardari has his own fiddle to play.